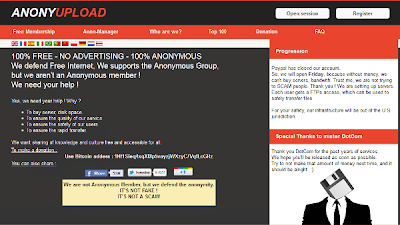 In response, the Anonyupload site has now been updated to read, "We are not Anonymous Member, but we defend the anonymity. IT'S NOT FAKE ! IT'S NOT A SCAM!." In addition, the site's Paypal account has apparently been removed which will make donations for the site harder to receive. In any case, this site appears to be the work of either one person or a very small group that is trying more to prove a point than to really launch a professional file sharing web site. Whether it is a scam or not, it's not likely to last. In the meantime, the real Anonymous group has continued to launch cyber attacks on other web sites. Informationweek.com reports that on Wednesday, Anonymous took credit with shutting down the the official website of France's president Nicolas Sarkozy along with the official website of the Virginia State Police.